Chicken is one of the best foods to drink wine with. People often think of chicken as white-wine food, but it has enough meatiness to go well with red wines. The only tricky thing about pairing wine is that chicken is a blank slate for chefs. A fried chicken sandwich with pickles and mayonnaise is entirely different from roast chicken with lemon and pepper. Sure, you can drink the same wine with both dishes, but the ideal wine for each would be very different. Here are a few popular chicken dishes and some wine suggestions. Fried chicken: Sparkling wine is a great pairing with fried food. If the fried chicken is spicy, try a slightly sweet sparkling wine. Barbecue chicken: Rosé goes well with most barbecue and chicken is no exception. Roast chicken: Roasting a chicken with plenty of garlic is the most wine-friendly way to prepare the bird and you could have any favorite wine with it. If you want to have a big red wine, add a side dish of mashed potatoes with gravy. Grilled chicken: Light red wines like Pinot Noir or heavier white wines like Chardonnay meet in the middle on the table with grilled chicken. Chicken soup: A chilled white wine is nice with hot soup. Try a light white like Pinot Grigio. 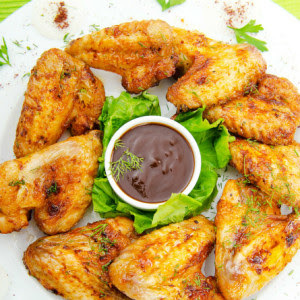 Chicken wings: Fruity wines go well with wings. Pinot Noir or Merlot will be fine with wings if they're not spicy. If they are spicy, try a Riesling. Chicken tenders: Because sparkling wine works with fried food, try a Moscato with chicken tenders. Sliced chicken breast: Chardonnay is ideal. Rotisserie chicken: Chardonnay, Sauvignon Blanc and Viognier are good with this delicious takeout special. Chicken curry: The classic pairing is an aromatic white wine like Riesling or Gewurztraminer, but I find that a Chardonnay with some oak on it works better than you might expect. Chicken enchiladas: I like sparkling rosé with these. I want to serve red wine with my chicken. What should I do? * Serve a red-wine-friendly side dish like mashed potatoes. Mac and cheese also works. 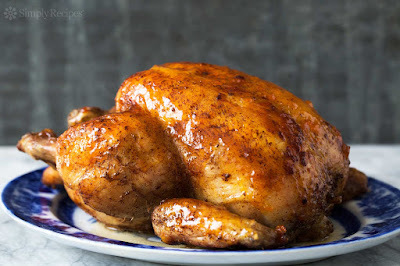 The roast chicken picture is making me hungry, and it's only 9 AM. I tend to have red wine with most chicken recipes. With roast chicken, I often have a Loire Cabernet Franc.